Have you noticed how much we tend to compare ourselves to other animals and see to what extent they are like us? That’s all quite normal, of course. All animals judge other animals to some extent, although I should say size up, gauge, or perceive, rather than judge. Seeing how similar you are to others is a more useful way to judge, especially if you want to discover the similarities we share. Approaching perception this way dims the illusion of self and lowers the ego’s exposure. This helps you blend in more with the rest of creation. Fortunately, science continues to erase the line of distinction between ‘them’ and us in its search for the truth. Indeed, the bottom-line truth is much closer to similarity than difference. As chapter 56 says, This is called profound sameness. All one needs to do is observe and be open enough to see it. 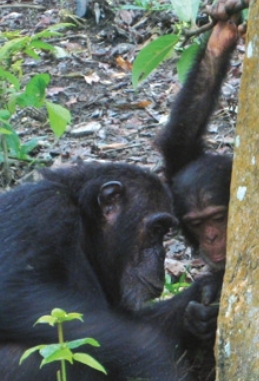 This Science New article, Group to Group, documented the transfer of a cultural tradition from one wild chimp group to another. It helps put yet another nail in the coffin of human uniqueness—and the “man created in god’s image” type myths. If seeking out similarity promotes a greater sense of universal inclusiveness (spiritual Oneness), why do we so often fight tooth and nail to maintain illusions of difference? I suppose it all comes down to ego survival. It appears that seeing ourselves unique, as in ‘created in God’s image’, promises us ego security. The irony is that it does just the opposite; the ego’s illusion of self is a precarious position. The female normally uses stillness to overcome the male. I’ve found the following rule of thumb helpful, “Difference points to illusion; similarity points to reality”. While this certainly doesn’t stop me from noticing differences, it does help remind me that I’m not seeing reality, but rather a projection of my own needs and fears—the bio-hoodwink.